Drs. Lynette Monteiro and Frank Musten have written a gem. This book will be a trusty companion to anyone taking a mindfulness-based stress reduction course or who chooses to independently explore mindfulness practices for an engaged and meaningful life. 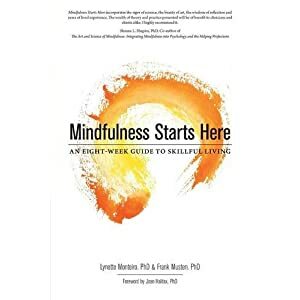 Mindfulness Starts Here is a practical and inviting guide that can help you to make positive changes in how you live your life, starting now. Dr. Bauer-Wu is a researcher, clinician and mindfulness teacher whose work in stress resilience and compassionate end-of-life care is highly respected. She teaches in training programs for mindfulness-based interventions, integrative medicine and contemplative care. A review of her book Leaves Falling Gently can be read here. A recent article explores her teaching on living with the stress of cancer and other serious illness; read part 1 and part 2. Dr. Bauer-Wu is offering a retreat at Upaya Zen Institute in Santa Fe NM on CALM, CLARITY, AND COMPASSION in the Storm of Healthcare and Illness. Next We are 10 Years Old! Well-deserved praise for my mindfulness teachers and mentors. I am sure that many people will gain useful insights from your words. Congratulations.